Cobblers left-back Dave Buchanan says Manchester United have ‘got everything to lose’ as they head to Northampton for Wednesday night’s EFL Cup match at Sixfields (ko 7.45pm). 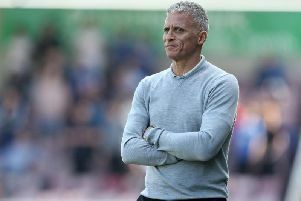 Buchanan is a lifelong United fan and is looking forward perhaps more than anybody else to lining up against the Old Trafford giants, but his sights are firmly set on doing his utmost to help the Cobblers to what would be a stunning giant-killing. Although Jose Mourinho is not under pressure for his job, he prides himself on winning football matches and they need to turn the corner quickly. It doesn’t matter if it’s Northampton Town or Barcelona, they are Manchester United and their fans all around the world expect them to win. Jose Mourinho’s team have lost their past three matches and all is not well at the Theatre Of Dreams at the moment, and Buchanan feels the last thing the manager and United players low on confidence would want is a trip to league one club in a midweek cup tie. But that is exactly what they are facing at a sold-out Sixfields on Wednesday. “Coming into this game, Manchester United have got everything to lose,” said Buchanan, who is set to skipper the Cobblers with club captain Marc Richards likely to start on the bench. “We are massive underdogs we know that, we are a league one team, and they are a Premier League team. “They have the most expensive player in the world, and all those highly-decorated players, but what I can say is they have lost three games on the trot. “Confidence is going to be a little bit low, and I just hope they come here expecting to roll us over and then take their foot off the gas a bit. United may have a host of big names in their squad, with players costing ridiculous amounts of money. They recently signed Paul Pogba from Juventus for an eye-watering £89m, and also have the likes of Zlatan Ibvrahimovic, who is reportedly paid more than £300,000 per week, and England captain Wayne Rooney on their payroll. “You see the media and world press the club gets, and they have the world’s most expensive player in Paul Pogba playing for them,” said Buchanan, who signed for the Cobblers on a free transfer from Preston North End last in the summer of 2015. “Hopefully he plays, and then you have players who have won everything, such as Zlatan Ibrahimovic, and it is a team full of world-class players that have Champions League winners’ medals, Premier League medals, World Cups. Buchanan knows he and his team-mates are huge underdogs going into the game, but he says all of the pressure is on the visitors, and there is always that chance, no matter how slim, of a giant-killing. “They are the highest paid players in the world, they have that price-tag that comes with them, they have the most-spoken about manager and successful coach in the world in Jose Mourinho,” said the Cobblers man. “But the manager is not going to be happy at the minute is he? “I think for Northampton as a club and as a town, what has happened to Manchester United in the past week or so has made this match even bigger. “Although Jose Mourinho is not under pressure for his job, he prides himself on winning football matches and they need to turn the corner quickly. “It doesn’t matter if it’s Northampton Town or Barcelona, they are Manchester United and their fans all around the world expect them to win. “But at any level in any sport, it is just you against the person you are playing against. “Wages and transfer fees go out of the window, and it is just you against your opponent.